My big race was a few weeks ago and this year my husband and I decided to stay at a hotel in Carlsbad. I promise I didn't research ahead of time, but I was surprised to find a cupcake shop across the street from our hotel! What could be more perfect? Although this was my first visit to CB's Cupcakes, this wasn't my first time eating one of their cupcakes. You might recognize CB's Cupcakes from the OC Fair. I did. The ordering process at CB's Cupcakes is the same as it is at the OC Fair: (1) choose your favorite cake, (2) choose a frosting, (3) choose your favorite toppings. The shop was decorated for Easter, as this was a few weeks ago. 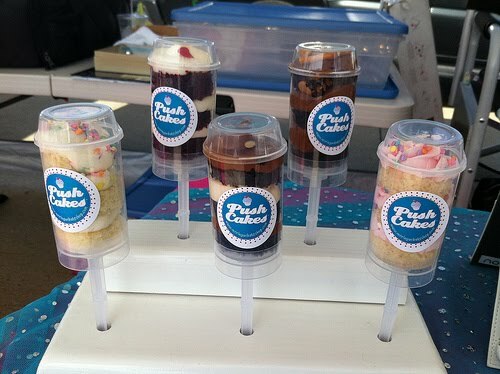 How adorable are these cupcakes in pots? I've seen frosting shots before, but never like this. A whole cup of frosting with your favorite topping. Only $1.50 for this sugar high. I kinda wish I had tried it. This cupcake stand was fun and unique, but I didn't like how the cupcakes looked. They need better wrappers. I love that more and more cupcake shops are offering doggie cupcakes. This made me miss my puppy, since she didn't come with us on our weekend getaway. My husband and I each got a custom cupcake. I picked a Key Lime cake, with Lime Zest frosting, and Graham Cracker topping. I love this flavor combo and it didn't disappoint. My husband picked a Chocolate cake, with Peanut Butter frosting, and Oreo topping. This cupcake was average, not great, but not bad either. The cake had medium moistness. CB's Cupcakes also sells Cupcake Bites. We picked a Red Velvet one and it was pretty good. The problem with Cupcake Bites is that there isn't too much variation between each store. This tasted just like every other red velvet cupcake bite I've eaten before. BUT, that being said, it was delicious and it satisfied my craving. I like the concept of picking my own cupcake and frosting. Sometimes it's nice to have the customer be in control of their own satisfaction. CB's Cupcakes are ok and I would definitely eat one again and again. Their mini cupcakes sell for $1.50 and their regulars for $3.50. CB's Cupcakes has two locations: San Diego and Carlsbad. You can also find them at the OC Fair, as well as other fairs around Southern California (see schedule here). CB's Cupcakes will definitely satisfy your cupcake craving. 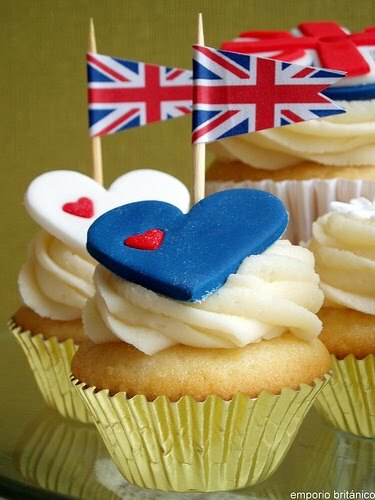 Will you be watching the Royal Wedding? I hear it talked about a lot in the news, but it just hasn't grabbed my attention. I think I'm in the minority for that though. 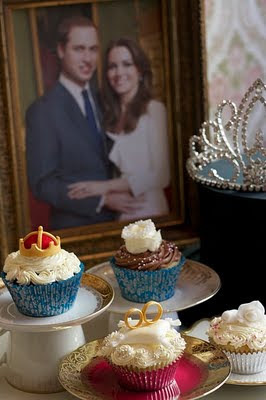 Cupcakes Take The Cake has posted several pictures of Royal Wedding cupcakes. 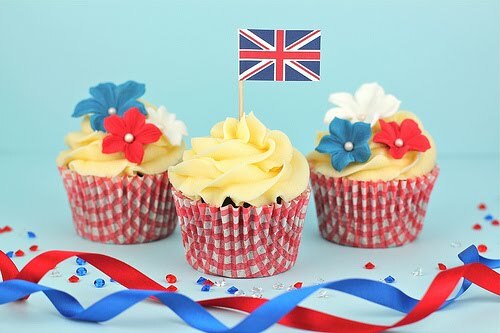 I have to admit, the cupcakes are pretty cute. Yesterday was a computer-less day. Didn't realize how much I rely on my computer for everything. I will be back tomorrow with more cupcake goodness. Of course the best part about going to the movies (besides the movie) is the candy. Although movie theater candy is way overpriced, I still love it anyway. Last month CinemaCon held it's annual convention at Caesar's Palace in Las Vegas. One of the booths in attendance was Taste of Nature. You might know them by their popular candy -- Cookie Dough Bites. This year they introduced a new product -- Cupcake Bites. This candy has a "tasty cupcake center covered in a yummy coating of frosting and topped off with multi-color sprinkles." I have to try them because I'm interested in finding out what a cupcake center is. Have you seen or tried them yet? How Far Do I Have to Run to Burn Off a Sprinkles Cupcake? The other day someone told me that she found my blog by researching how far she'd had to run to eat one Sprinkles cupcake. I've wondered this too, but I'm in denial about how many calories are in cupcakes. Being the health-nut that I am, I should probably know this info. So here goes...if you don't read any further, I totally understand. Last year I posted some nutrition facts for two of my favorite Sprinkles cupcakes (pumpkin and red velvet). 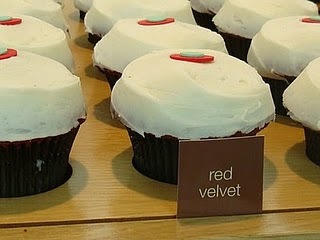 Since Red Velvet is one of the most popular flavors, we'll use it in today's example. According to healthstatus.com, a 140lb person running at a 7mph pace (8:30 mile) will burn 730 calories an hour. So to burn a 497 calorie cupcake, you would have to run for 40.8 minutes. At a pace of 7mph, that's 4.8 miles. 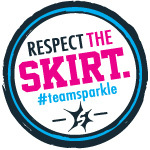 So in order to enjoy one Sprinkles Red Velvet cupcake, you would have to run 4.8 miles to burn it off. 4.8 miles is a long run. Would it be worth it to you? I'm interested to hear what you think. The past few weeks has been super busy for me, and I've been stressed because I have several reviews in my pocket, but haven't had the time to share them with you. But tax season is finally over and now the fun begins! 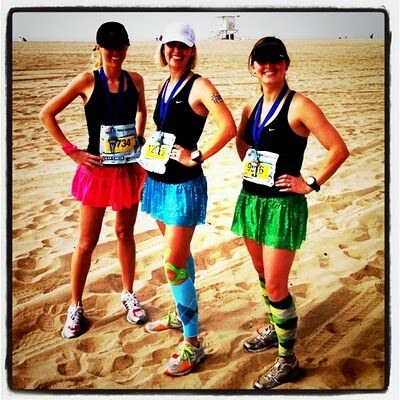 At the beginning of this month I had my big race in Oceanside, CA. Of course I always eat cupcakes after my big races and this was no exception. And the best part is that the cupcakes came to me. Sara of Vignette Patisserie was so sweet and delivered a box of cupcakes to my hotel. Vignette Patisserie cupcakes are no ordinary cupcakes. Their organic cupcakes are made and inspired by local ingredients. I've never been a huge organic cupcake fan, but after tasting these cupcakes, my whole view changed. When I first saw the ingredients, I thought carrot, but then I researched and found out that cara cara is a type of orange. The cake was dense and delightful. I'm a huge fan of curd and this one didn't disappoint. The cream cheese frosting was perfect. I seriously couldn't believe this was organic. I'm not a coffee drinker, but I love the smell of it. My husband summed this cupcake up best: tastes like a frappuccino. Even though the frosting was whipped (not usually my favorite), it complemented this cupcake well. This cupcake is probably best served cold, as it was for me. I love that this was made with local strawberries. Our hotel just happened to be next to a giant strawberry field, so I imagine the strawberries came from there. The cake was dense and luscious. The frosting (same as the cara cara) was awesome. I love cream cheese frosting made right. This was my favorite cupcake of the bunch. Again, I thought I wouldn't like the whipped frosting, but it was delicious. The frosting had a heavy mousse consistency...so good! Sometimes whipped frosting is the best way to go with a heavy chocolate cupcake. The chocolate cake was heavenly. This was a close second for my favorite. Vignette Patisserie is a predominantly organic, french-inspired cupcake bakery based in Encinitas, CA. The cupcakes are available for custom order, but can also be found on the popular food truck MIHO Gastrotruck. I can tell you this for certain, Sara knows what she's doing. I know the difference between an average cupcake and a great one. And Vignette Patisserie's cupcakes are the work of an experienced and talented baker. Last week I introduced you to Peep Push Pops from Love in the Oven. Since Easter is just a few days away, I want to showcase a few other Easter treats that use Peeps (since they are my favorite Easter candy). First is this Rice Krispie Treat Pizza from cookies and cups. 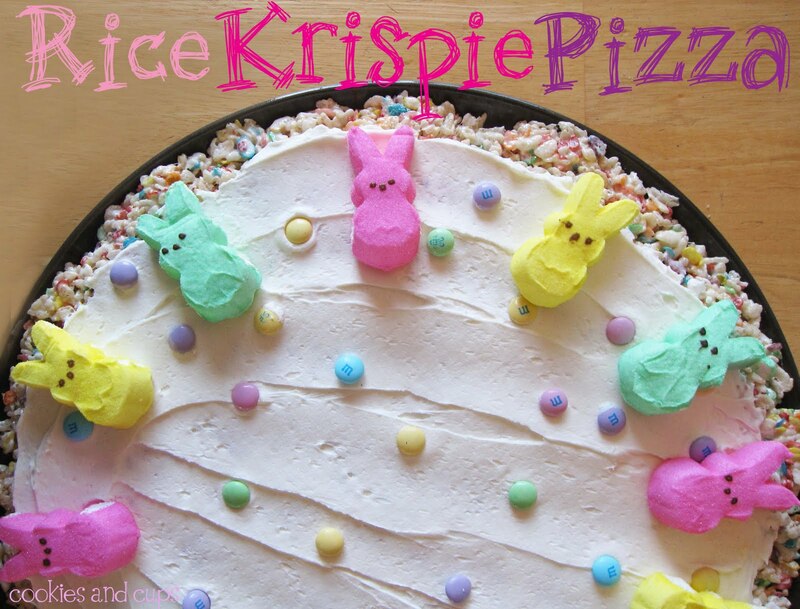 A fun combination of rice krispie treats and Peeps. 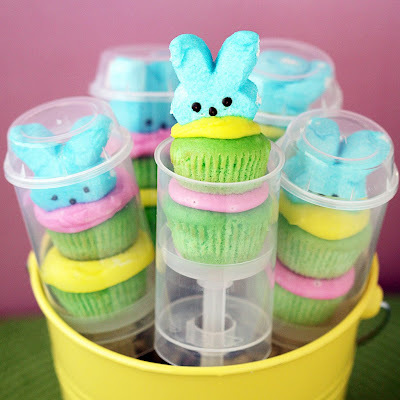 This one isn't really a treat, but a cute Easter decoration (although I'm sure you could eat it when you're done if you're that type of person that loves hard Peeps). 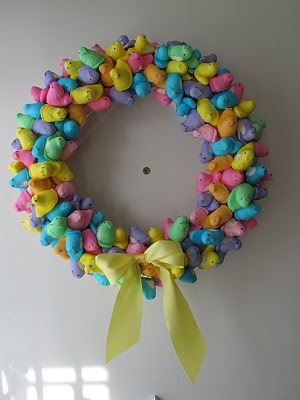 Our Best Bites has a quick and easy tutorial for a Peep Wreath. I love it! I would love to make this for my home, but I'm pretty sure my dog would eat it. And the last thing she needs is more sugar. Me, on the other hand, I'm perfectly fine with more sugar. Ok, this last one is very unique. Check out Peep Ceviche from Endless Simmer. 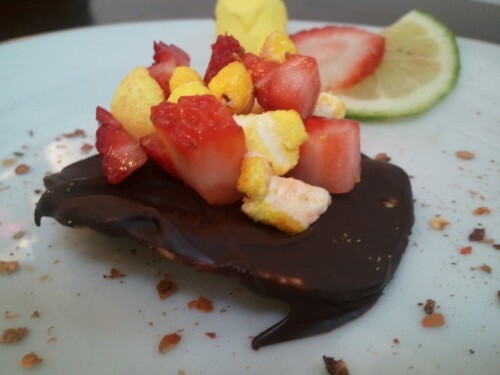 Chopped Peeps, fresh lime juice, chili peppers, and raw chopped strawberries on top of a dark chocolate dipped tortilla chip. Awesome idea if you're looking for something different. Last week I wrote about Cinnabon giving away Cupcake Bites to celebrate the end of tax season. A few days ago I received an email from Cinnabon informing me of this year's giveaway. On April 18th Cinnabon will be giving away Cinnabon Classic Bites because "Tax Day Bites." The giveaway is from 6-8pm. Cinnabon is also having an online tweet contest (through April 18th) where people can share how Cinnabon added frosting to an otherwise bad day. One lucky tweet will be awarded a $100 gift card. Their twitter handle is @CinnabonInc. I can't wait until tax season is over. Just five more days! A friend passed along an article about this product and I think it's the only cupcake-related product I wouldn't want to try. Cupcake toothpaste just sounds weird. 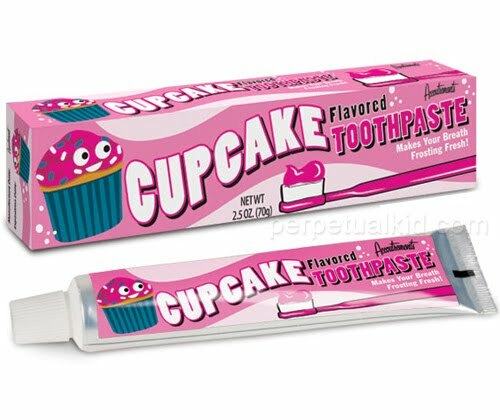 I only like minty-flavored toothpaste because I actually feel like my teeth are getting cleaned. What do you think? Would you try? A few months ago Meringue Bake Shop introduced us to Push Cakes. 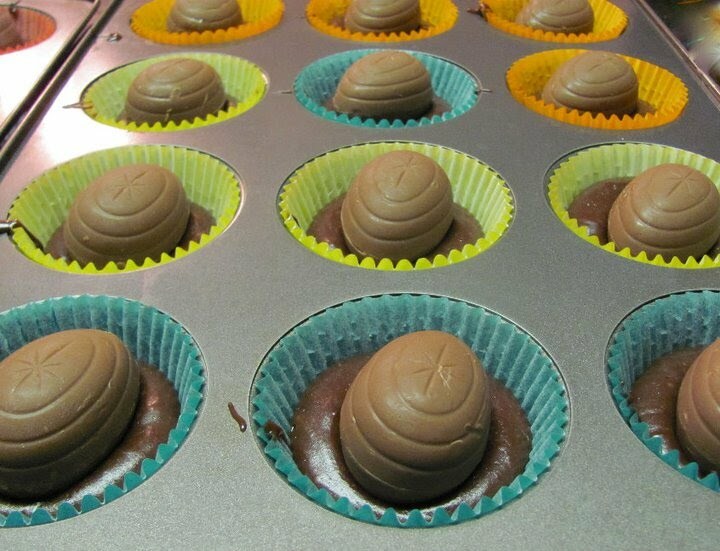 They are exactly what they sound like: push up cupcakes. The layers of cake, frosting, and other goodies sound heavenly (sadly I haven't tried one yet)! Now I see push up cupcakes everywhere. Recently, Cupcakes Take the Cake highlighted Cupcake Push Pop Peeps from Love From the Oven. These adorable Easter treats are made from mini cupcakes, frosting, and Peeps. Seriously so cute! 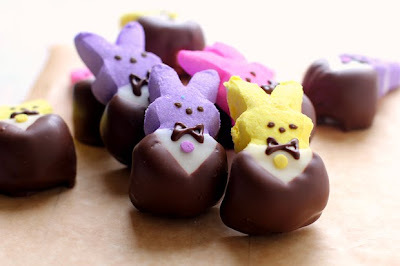 And speaking of Peeps, check out these Tuxedo Peeps featured on Cheeky Kitchen. I love Easter candy! 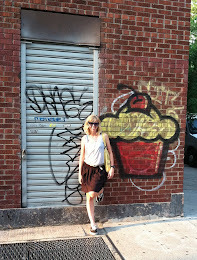 It's seems like just yesterday that I was just eating cupcakes from Divine Desserts and now I hear that they're closed! On Monday the Fast Food Maven reported that Divine Desserts has closed and will be replaced by Cinderella Cakes. I'm really surprised to hear this news because Divine Desserts made quality cupcakes. 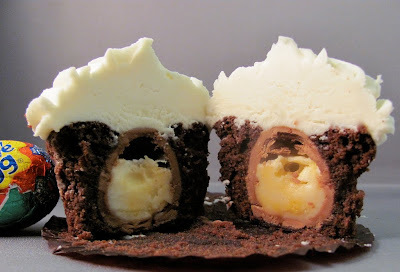 They even made it on the list of My Top 10 Cupcakes of All Time. I'm not sure what happened, but I'm hoping they will resurface somewhere else. Interesting to note that Divine Desserts website now forwards to Cinderella Cakes website. 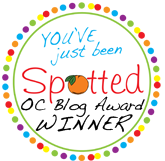 Cinderella Cakes already has three Orange County locations, yet this is the first I've heard of them. 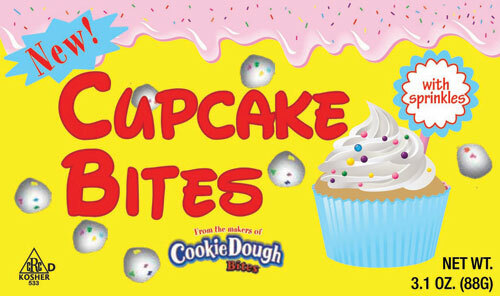 Their website does have pictures of cupcakes, but I'm unsure if they will be selling them in their store. I'll keep you updated. At the end of last year I reported on Scharffen Berger Chocolate's Adventure Contest. Entrants submitted an original recipe using Scharffen Berger chocolate and an "adventure" ingredient for a chance to win $20,000 in prizes. The winners have been announced and the best part is that they published the winning recipes! Interesting to note that all of the winning cupcakes used stout beer. Maybe that tells you something about the judges. The Guilt Free Cupcake Diet? As much as I love cupcakes, I have a hard time believing you can lose weight eating lots of cupcakes. You know me, I'm a pretty healthy person. So when I got an email about Twiggy's Cupcake Diet, I was intrigued. They claim the average person will lose 8-10 pounds a month on this diet (based on a previous diet of 2500-3000 calories. Well yeah, when you cut your calorie consumption in half, you're definitely going to lose weight. Free Cupcakes on Tax Day Again? Last year Cinnabon gave away free cupcakes on Tax Day. April 15th is a big day to me because I'm a tax accountant and my life has been pretty stressful for the past few months. So let me tell you, I could definitely use some free cupcakes. 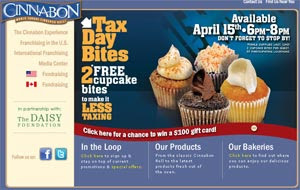 Hopefully Cinnabon will continue this promotion and I will get some sweet relief on Tax Day this year. I completed Ironman 70.3 California. I ate cupcakes from two different places. And I got a whole weekend with my husband. Doesn't get better than that. More details about the cupcakes to come. I just need to recover and catch up on all of my work.